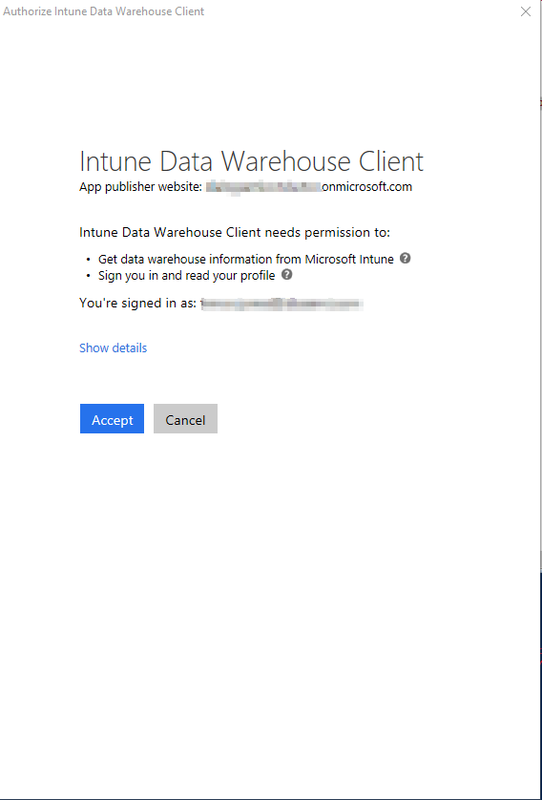 The Intune Data Warehouse is a great addition to the Microsoft Intune service allowing visibility of historical data for reporting, data and trend analysis for your Microsoft MDM environment. It comes with an OData feed that allows you to connect to the data with PowerBI, Microsoft’s reporting and data visualization service. The Data Warehouse RESTful API (currently in Beta) can be used to get data from the warehouse using a REST client. I decided to explore how to do this with PowerShell so I can run some ad-hoc queries and analyse trends in the data. In your Azure portal, go to Azure Active Directory > App registrations. Click New application registration. Give it a name, make sure it is a Native app (do not use Web app / API) and use the redirect URI https://login.live.com/oauth20_desktop.srf . Once created, make a note of the Application ID as we will need this later. 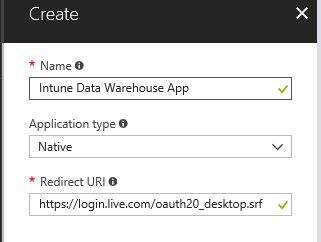 Now, in the App in the Settings blade, click Required permissions > Add > Select an API and select Microsoft Intune API. 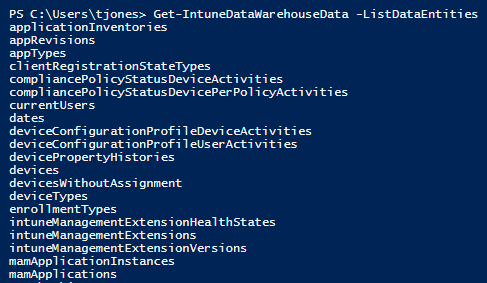 In the Add API access blade click Select permissions and grant the delegated permission Get data warehouse information from Microsoft Intune. To authenticate with Azure we need to use the Active Directory Authentication Library from Microsoft. This library is actually included in resources like the ConfigMgr client and the AzureRM PowerShell module, but these do not have the latest versions of the library and the methods it contains have changed over time. So I prefer to use the latest version of the library (3.17.2 at the time of writing) which is available as a NuGet package. The function will download NuGet and use it to download the latest version of the ADAL library to your user profile area. Once we have the library we will add it in PowerShell. Then we will acquire an access token. The access token expires after an hour so once created, the token will probably be good for your current session. If it expires, simply run the function again. The access token will be saved to a variable in the script scope and will be used by the function that queries the data warehouse. Make sure the following parameters contain the required values. I recommend that you store those in the function directly so you don’t have to add them every time. 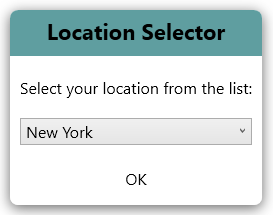 The function uses the custom OData feed URL for your tenant, creates an http client to invoke the web service and gets data for the data entity (ie collection, or table) that you specify. The results are then returned to the PowerShell console. You can read more about the data model for the warehouse and get a reference for the various data entities and their relationships on the Microsoft Docs site. 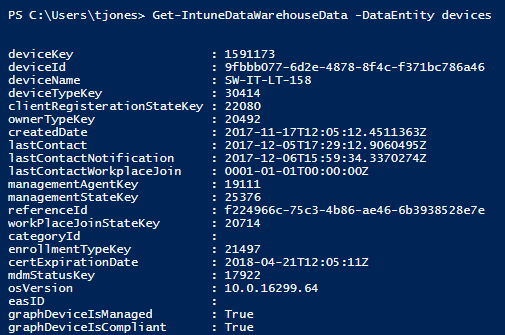 This Url is the custom feed URL for your tenant and you can find it from the Intune blade in Azure. On the Overview blade, on the right you find Other tasks and underneath Set up Intune Data Warehouse. To return the data from a specific data entity, use the DataEntity parameter. This example returns data from the devices table. The API supports a few query parameters in the OData protocol v4.0, so rather than returning all the results in the data entity, you can narrow them down. However, I have noticed that the query parameters do not always work as expected when they are combined, at least in the beta version of the API. Get-IntuneDataWarehouseData -DataEntity devices -Filter "deviceName eq 'SW-IT-LT-AZURE1'"
You can learn more about how to use query parameters in the OData protocol from the Microsoft Developer site for the Graph API. These query parameters are certainly helpful, but for relational queries where you want to reference more than one table or entity, the API comes short and more complex Powershell code is required. For example, here I am searching for the ethernet MAC address from the most recent hardware inventory for a device, and even with query parameters applied I still need to do some filtering and sorting in Powershell. Remember that the data warehouse only contains snapshots of historic data, so for current data you can use the Graph API instead, but this is just for an example. This code takes a while to run however because it’s querying the data warehouse more than once to get the data. Another way to do this would be to first load the required device entities into memory, then I can query them more quickly and run other queries from this cached data. The benefit of a data warehouse of course is that you can review snapshots of data over a period of time and analyse the data for trends or identify when things changed. The following example is using the data hashtable and is reporting the device inventory history of a specific device over time. The Intune data warehouse keeps up to 90 days of historic data. 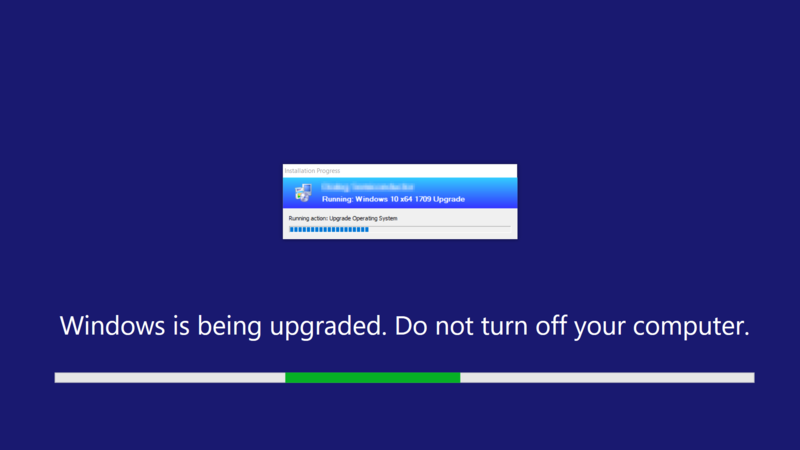 In particular, I want to see how much the free space on disk is changing over time. You can readily see that it’s necessary to manipulate the data quite a bit to get the results I want to see, for example in order to do something equivalent to a ‘join’ in SQL I am using Where-Object, and in order to add the data from another table to my results I am using Add-Member. I am also converting the values of the storage data into GB and formatting the date using the UK short date code. The results are returned in an array object, but for data like this it can also be useful to use a datatable as you would for SQL data for example. Then you can add / remove columns, change column order, set the datatype for a column, change headers etc. This code does exactly the same thing as the last example, but using a datatable for the results. Reviewing the results I can see that the available disk space is decreasing slightly over time. It would be nice to see that data represented graphically, and of course this is where the integration with PowerBI will shine, but we can also generate graphical charts in Powershell, so let’s give that a go. Here is a function I wrote that will generate a spline chart using the .Net chart controls and display it in a WPF window. It takes a single series of data and you need to provide a title, a data object as an array, the X and Y axis names (which must match the header names in the data object). 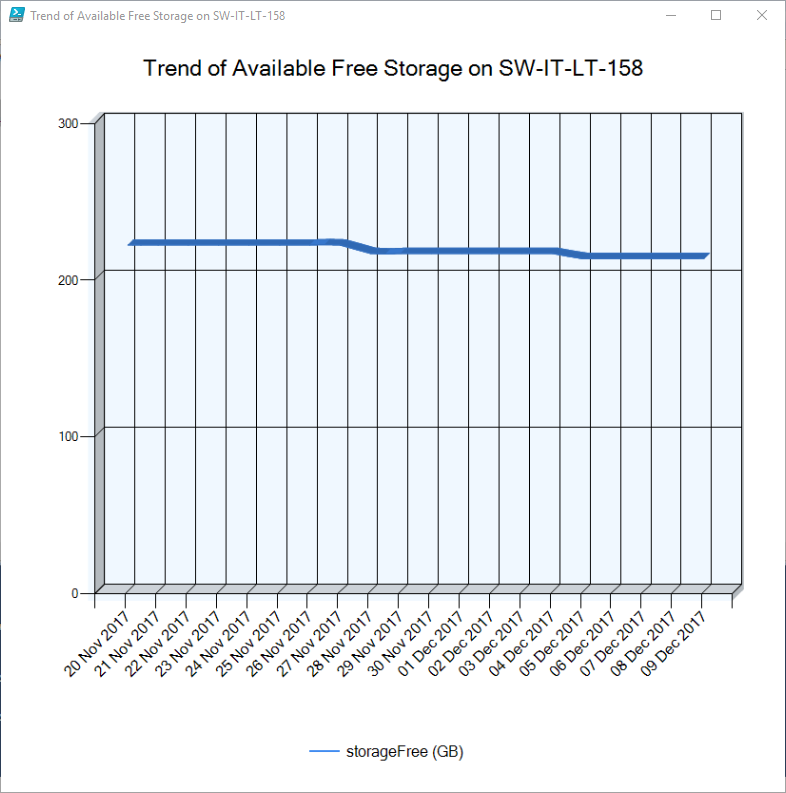 New-SingleSeriesSplineChart -Title "Trend of Available Free Storage on SW-IT-LT-158" -Data $Data -AxisX "date" -AxisY "storageFree (GB)"
I have focused just on devices in this blog, but there is lots of data available in the Intune Data Warehouse including users, policies, compliance, configurations, MAM data etc, all of which can provide valuable insights into your MDM estate and whether you use PowerShell, PowerBI, Excel or whichever tool, the ability to view and analyse historic data is a welcome improvement to the ever-evolving Intune service. One feature I would really like to see added to a Configuration Manager task sequence is the ability to natively provide notification messages to the logged-on user. 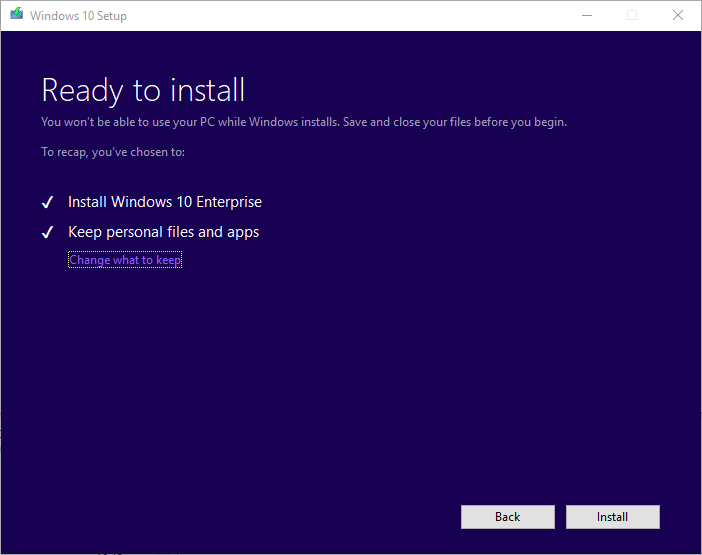 Previously, to accomplish this, I have used simple pop-up notifications like the Wscript Shell Popup method in a PowerShell script, together with the handy ServiceUI utility in MDT to display the notification in the logged-on users’ session. This has worked well enough for simple messages, and has been useful in several scenarios. For example, see my blog post about prompting for input during a task sequence. Recently I wrote a PowerShell function to display my own custom notifications using WPF, called New-WPFMessageBox. This allows for much greater customisation of the message box, including adding your own WPF content. So I decided to revisit displaying notifications during a task sequence using this new function instead. 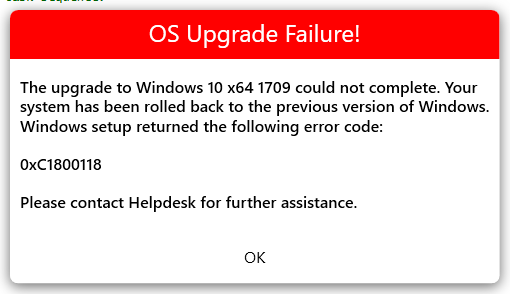 In this post I will show you how to add a “Restart Required” notification to run at the end of a task sequence. 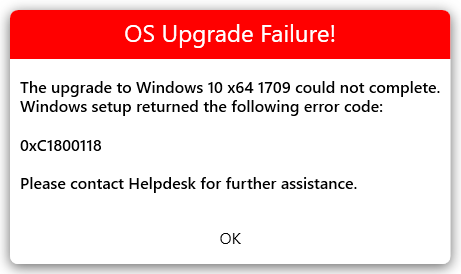 This can be used to advise the user that a restart needs to take place after the installation of some software for example, and give them the option to restart immediately, or restart later. 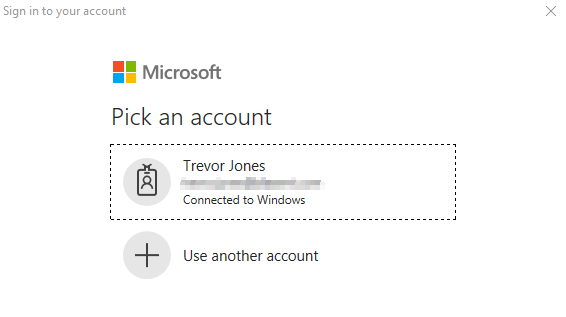 Instead of using the ServiceUI utility – which works well, but it still runs in SYSTEM context even though it will allow you to display in the logged-on users’ session – I decided on a different method that allows you to truly run a process in the users’ context. Thanks to a tip from Roger Zander I found some C# sharp code by a guy named Justin Murray that can be used in PowerShell to make this possible. Create a new PowerShell script containing the following code. In the $Source variable, copy and paste the C# code from https://github.com/murrayju/CreateProcessAsUser/blob/master/ProcessExtensions/ProcessExtensions.cs. I have renamed the namespace (line 4 in the C# code) from namespace murrayju.ProcessExtensions to namespace Runasuser. Create a new PowerShell script containing the following code. At the top paste in my New-WPFMessageBox function from https://gist.github.com/SMSAgentSoftware/0c0eee98a673b6ac34f5215ea6841beb. You can, of course, customise the notification as you wish. 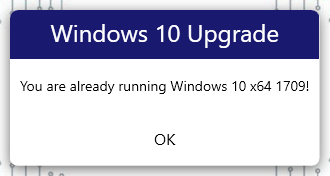 Content = "You must restart your computer before using Software X." 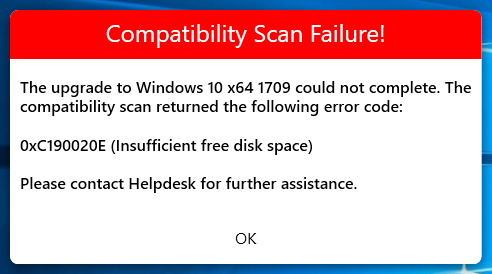 Title = "Computer Restart Required!" CustomButtons = "RESTART NOW","RESTART LATER"
The function saves the content of the button you click to the variable $WPFMessageBoxOutput, so you can use this to perform certain actions depending on which button the user clicks, in this case simply restarting the computer. This variable is only available in the script scope however. Save this script as Display-RestartNotification.ps1. 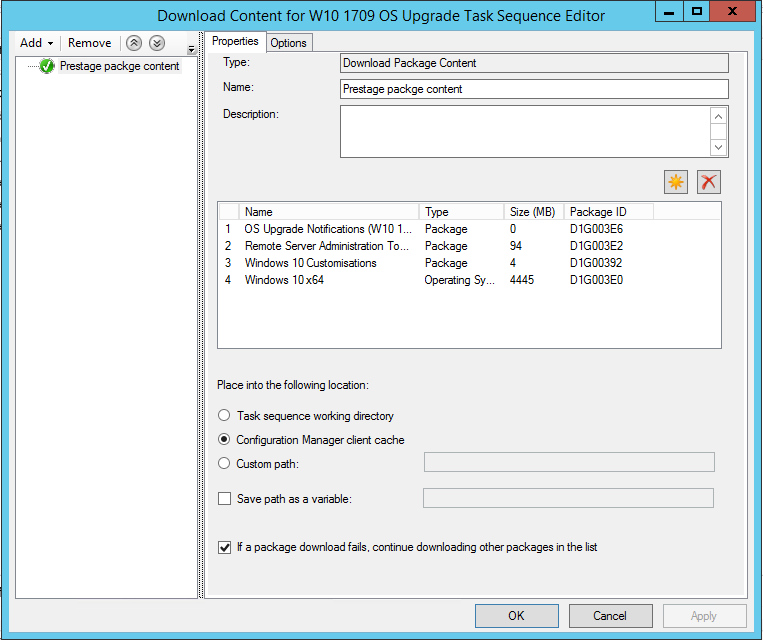 Now create a standard package in ConfigMgr containing both of these scripts in the same directory, and distribute the content. No program is required for the package. 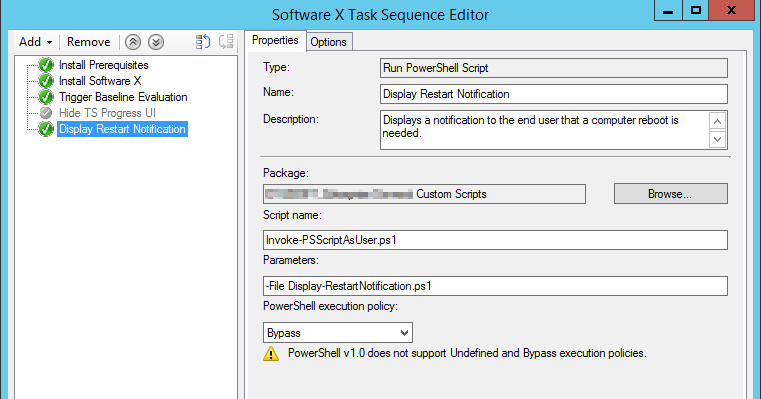 When the task sequence executes, it will run the Invoke-PSScriptAsUser.ps1 in SYSTEM context, which will in turn run PowerShell in the logged-on users’ context and run the Display-RestartNotification.ps1 script, which displays the notification to the user. 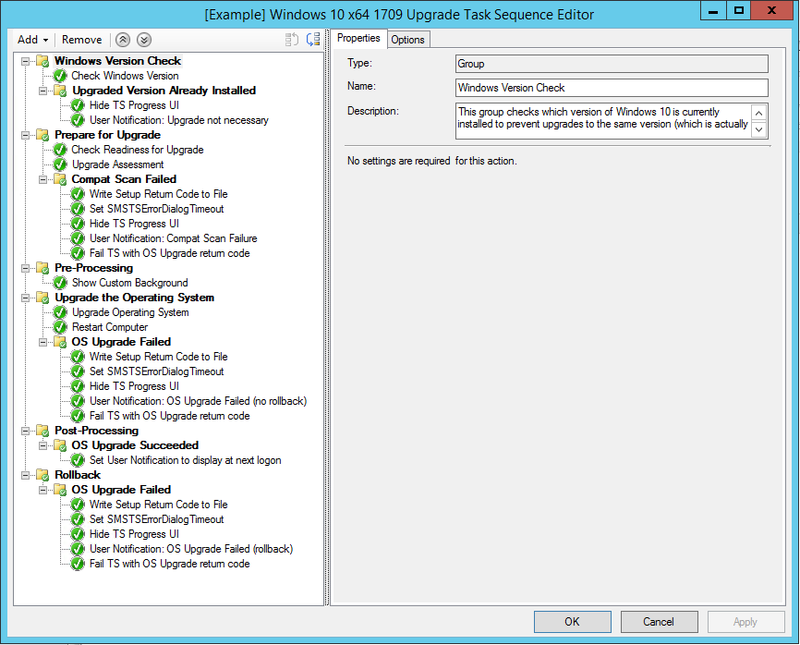 The task sequence will not wait for the user to respond to the message; it will simply finish up in the background and the notification will remain on screen until the user responds to it. 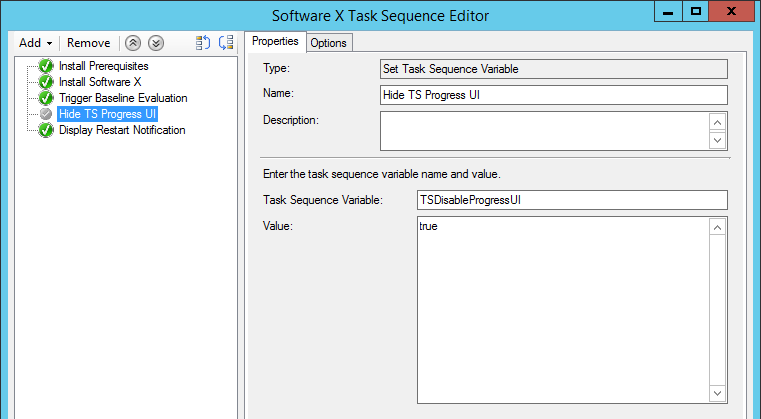 The ability to run a process in the user context during a task sequence is quite useful, not just for displaying notifications, but for running any code or process that must run in the user context, for example setting HKCU registry keys, or triggering a baseline evaluation that has user-based settings. The guys over at Arction have kindly made available a free Gauge control for WPF. I decided to download it and create a clock using PowerShell. 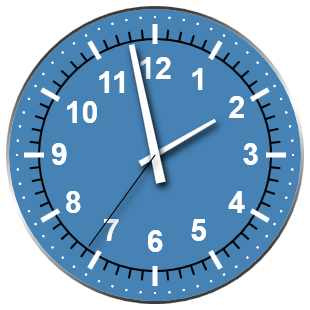 The result is New-WPFClock. To use the function, first download the free Gauge control. You’ll find the Arction.WPF.Gauges.dll in the Libs\Wpf folder. In the script on line 26, enter the location of this dll on your system. To close the clock, simply right-click it. 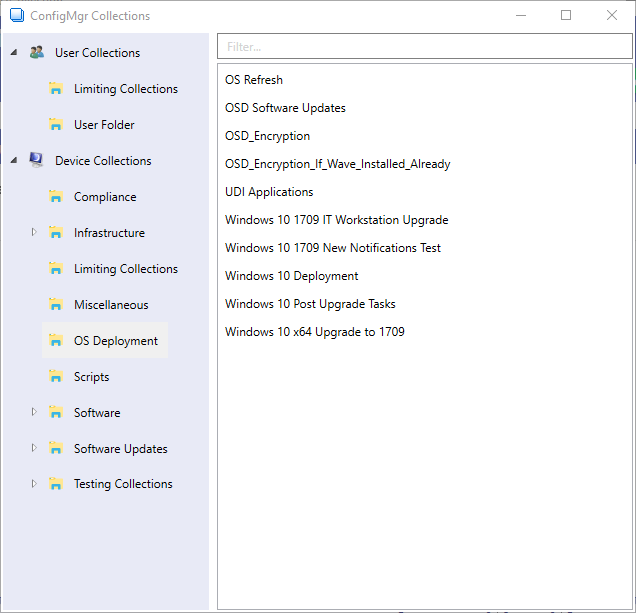 When upgrading your ConfigMgr site, or installing an update that creates a new ConfigMgr client package, it can be helpful to monitor the rollout of the new client version in your environment. 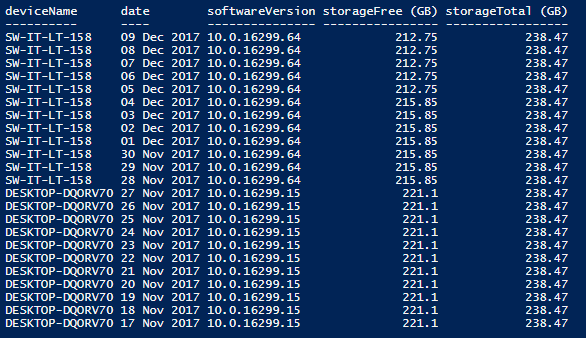 I put together this PowerShell function which uses my New-WPFMessageBox function to graphically display the count and percentage of client versions in the ConfigMgr site. The data comes from a SQL query, so you’ll need minimum db_datareader access to your ConfigMgr database with your logged-in account, as well as the New-WPFMessageBox function. By default, it shows only active systems, but you can include inactive systems by checking the box.